Nice post! On splitting the route 5’s past Lindale into separate routes, I had a brief conversation with Bob Bourne and he said they couldn’t get past transfer wait time problems. 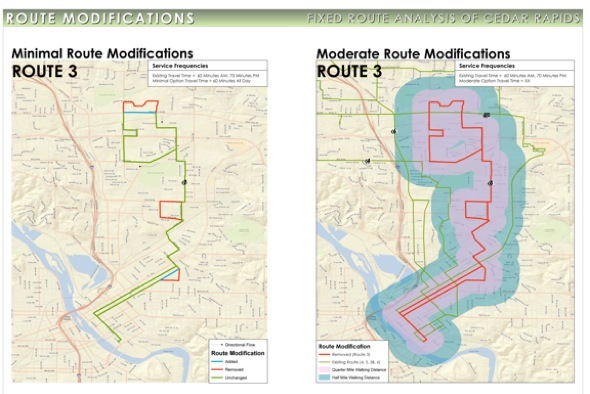 They found it would effectively create the same situation we currently have with downtown transfers because the downtown to Lindale segment is only 20 minutes. I’m not an expert at bus timing, so I can’t prove or disprove this. Also, I like the Facebook and Twitter ideas as an additional way of communicating. Do you know if a lot of CyRide users follow CyRide on Twitter and find it useful? Honestly I’m not sure how much added value Facebook and Twitter are for CyRide, since it is the same up-to-date information regarding detours, etc. posted on the website. 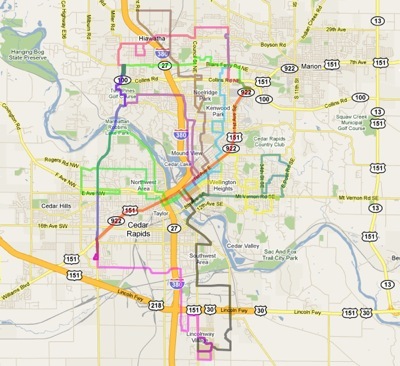 Of course CyRide is much more visible than CR Transit and almost culturally-engrained in Ames and especially the Iowa State community, so it seems almost expected that CyRide would have a presence on social networks. I feel CR Transit has and continues to simply operate as if it’s just another city department, instead of taking advantage of simple and free promotional tools. Many people have never considered taking the bus and probably know very little about it. A presence on social networks, and a more useful, attractive website could increase visibility, and potentially get a few more people to try it. I decided to register “CRtransit” on Twitter to reserve the name for CR Transit if they are ever inclined to start tweeting. I am a regular transit customer and I have often wondered why they do not offer either to lengthen the routes to 12 am or 24hour operation. There are many people who either work nights or would like to accept offers that have only night time hours and no car. This is another place where the bus would be more appreciated as well as to adding additional stops to businesses that they currently don’t offer access to! I believe this would be a great help to the community and there are people willing to work these hours driving. plus it would help create more jobs in the community!